Voltron returns for another adventure in this collectible chapter book retelling of the hottest new Netflix series, Voltron Legendary Defender from DreamWorks Animation! When Keith and Shiro enter the mysterious Blade of Marmora base, they are unprepared for what happens next. 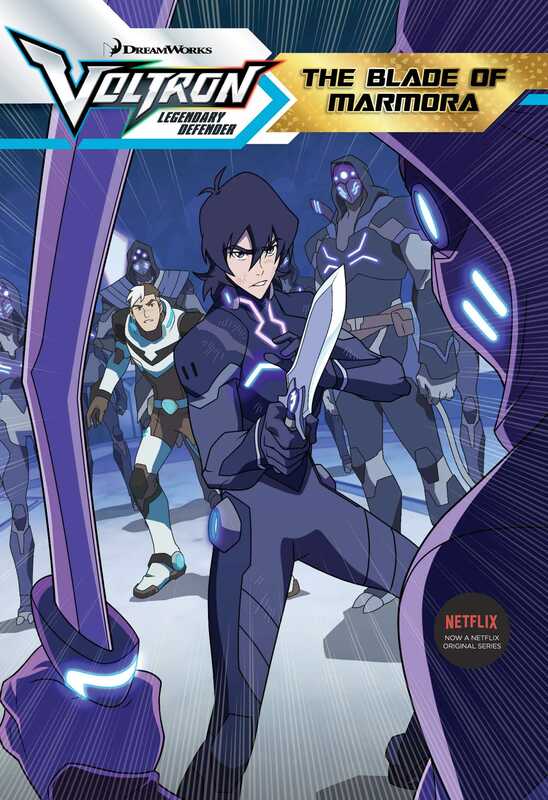 The Blade of Marmora is a secret society of Galra rebels—who know Keith has entered with one of their blades. Keith must withstand the Trials of Marmora to unlock its secrets, but only a Galra can activate the blade. Is Keith meant to go through the door and become a member of the Blade of Marmora? Or will the Red Lion need a new Paladin? The Paladins were on an important mission—to enter the Blade of Marmora’s base. They weren’t exactly sure what the Blade of Marmora was, but they knew that it had something to do with Galra rebels because a brave soldier named Ulaz had sacrificed his life for the Paladins. Before he died, Ulaz had told them that forming an alliance with the Blade of Marmora would be crucial in their fight against Emperor Zarkon. “Coran, how soon will we get to the Blade of Marmora’s base?” asked Shiro from inside the Castleship. They were on the bridge along with Hunk, Lance, Pidge, Keith, and Princess Allura. “We should be there within a few doboshes,” Coran replied. “Take us in slowly,” Shiro instructed. “That might prove the tiniest bit of a challenge,” Coran said. The Paladins looked outside. Coran wasn’t wrong—the base was located between two massive black holes and inside a giant blue star. “It’s the perfect defensive position,” said Pidge. “Or the perfect trap,” added Allura. Although Ulaz had freed Shiro from captivity and sacrificed himself for the Paladins, Allura didn’t trust him. Ulaz was Galra, and the Galra had destroyed her planet. Suddenly, a robotic voice belonging to the Blade of Marmora came from the Castleship’s main computer, and strange writing appeared on the holoscreen. “Identify yourself,” the voice said. “We are the Paladins of Voltron,” Shiro announced. It took some time for the voice to evaluate Shiro’s information. “Two may enter,” the voice finally said. “Come unarmed.” Then the writing disappeared. Allura was skeptical. “Why would they insist we come unarmed? This doesn’t feel right,” she said. But Shiro was unrelenting. Traveling near the star was going to be very, very hot—and only the Red Lion could withstand the heat. It was also very dangerous to get so close to the gravitational pull of the black holes. “One false move, and you’ll either be crushed into infinity or burnt to a crisp,” Coran warned. Shiro and Keith suited up.